Apple's Macs and iPads have lost significant ground in the U.S. educational market during the last three years, in 2016 slipping to third place behind Chromebooks and Windows devices, according to new research. Versus 2015, Macs fell a percentage point to just 5 percent of devices in the American K-12 segment, while iPads shrank five points to 14 percent, Futuresource Consulting said on Thursday. Apple's combined 19 percent put it below Windows' 22 percent, and well distant of the 58 percent owned by Chromebooks. 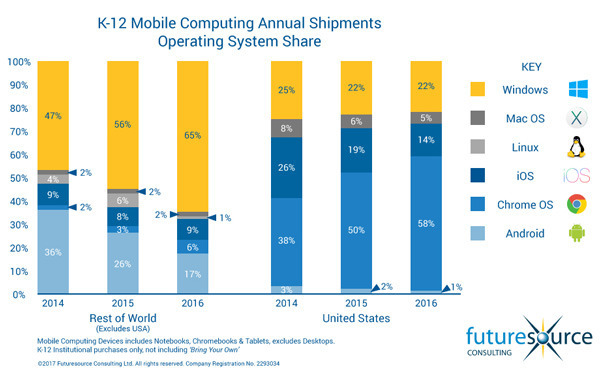 The market was more evenly distributed in 2014, with Chromebooks taking 38 percent, Apple 34 percent, and Windows 25 percent. Google's Chromebook platform has proven popular with schools for a number of reasons, among them up-front price —Chromebooks can sometimes cost less than $200. Maintenance personnel cite cloud-based provisioning for the Chromebooks as a positive, as well as the near-disposable low-cost of the individual devices as an advantage for the platform. The cheapest iPad, the Mini 2, starts at $269 before any bulk deals. A full-sized iPad is at least $399, while iPad Pros can cost $599 or more. Macs are even more expensive, with the cheapest recent model at retail being the $999 MacBook Air. Until late 2015, the white plastic MacBook was available to schools for as low as $600. 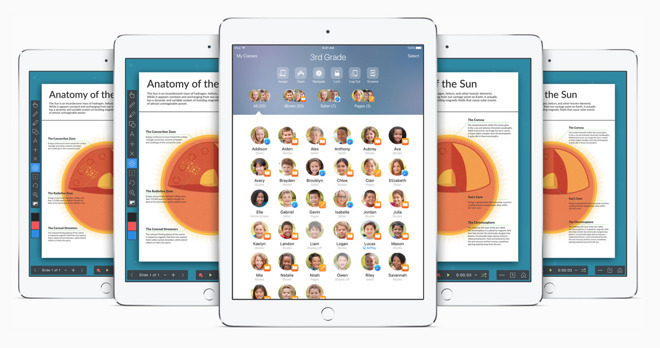 Prices can be somewhat lower for the hardware when purchased in quantity by a school, but Apple educational solutions generally bundle support and software up-front. This can appear to inflate the contract cost instead of it being obscured by long-term ad hoc support needs. Apple did make some strides towards better educational support in 2016, Futuresource noted. This included introducing a Classroom app for teachers, and multi-user support on the iPad, if only for students. The company often touts its presence in schools, for instance drawing attention through visits by executives like CEO Tim Cook. Futuresource observed that both Apple and Google were relatively marginal players outside the U.S. last year. While Apple held 11 percent of the market and Google about 23 percent (including Android), Windows devices dominated at 65 percent, growing significantly since 2014.